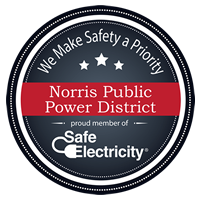 Norris Public Power District offers three monthly billing cycles. The cycle your account is billed under is noted on your statement. You will receive a bill shortly after the billed date noted below. If you would like to change the cycle you are billed under, please email us at info@norrispower.com or call 800-858-4707. Monthly bills can be paid each month electronically, by mail, over the phone, in person at any Norris area office or at a payment drop off location. The District accepts payments in the form of cash, checks and money orders. In addition, the District also accepts American Express, Discover, MasterCard and Visa credit/debit cards from customers who desire to charge their payments. Restrictions may apply. For your convenience, Norris has set up multiple bill payment options, which are described below. The kiosk allows customers to securely and conveniently access their account balance and also to make payments with cash, e-check, credit card or debit card 24 hours a day, seven days a week. To make a payment, customers will need to have their account number available, or a payment stub that contains a printed bar code and also the first four characters of their last name or organization. The kiosk will not accept paper checks as a payment method. The kiosk will not make change, your cash payment credited to your account will be equal to the exact amount of dollars inserted into the kiosk. All payments through the kiosk system will be immediately posted and account information will be updated. After each transaction, customers can choose to receive a printed receipt. The District offers customers the ability to pay their electric bill by phone twenty-four hours a day, seven days a week by calling our automated IVR System at 866-999-4503. Customers wishing to take advantage of the IVR system will need their four-digit PIN number and their Norris electric account number. The PIN number assigned to most accounts is the last four digits of the primary phone number on file with the District. The IVR system accepts credit and debit cards, as well as payments from a checking account. Sign up for paper-free billing to receive, view and pay your bill online. When your Norris electric bill is generated, you will receive an e-mail stating that your bill is ready to be viewed. If you are interested in taking advantage of our online SmartHub option, please register by clicking here. The Auto Pay Program is a convenient way of paying your electric bill. When you sign up for the Auto Pay Program, Norris automatically deducts your monthly bill amount from your checking or savings account or charges your American Express, Discover, MasterCard or Visa card on the due date of the bill. You will continue to receive monthly statements showing your kilowatt-hour usage and the amount due. To sign up for the Auto Pay Program, enter your information online when you register for SmartHub, or call any Norris office. Restrictions may apply. Residential customers may take advantage of the District’s Budget Billing Program after one year of service. The Budget Billing Program is a levelized plan which is based on a rolling 12-month average. This will eliminate the need to “catch-up” any balances at the end of a budget year since the budget amount is recalculated each month based on the most recent 12 month’s revenue. The only time you have to reconcile or “catch-up” your account is if you disconnect the service or no longer want to participate in the Budget Billing Program. The District has made arrangements with local banking institutions to accept your monthly electric payments. If you choose this option, please allow a few extra days for the bank to assist the District in processing your payment. See the list below for a location near you. For more information on any of these payment programs, please call 800-858-4707.